three-year-old Mr Pog* in tow. 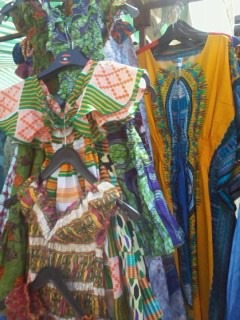 Ridley Road Market is not part of chi chi north London. It’s not a market that sells organic anything, or vintage anything, or heritage anything (or if it does, it’s only by accident and not so over-priced). It’s full on Hackney, vibrant, loud and international and I’ve only ever stared at one end of it as we went by on the bus. speed on his scooter. This did not come out of my Live Below the Line budget. inspired me to go there. 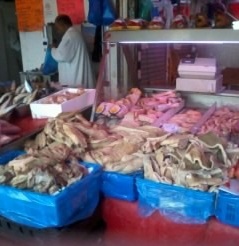 manioc, £5 bags of Caribbean snapper and strong-smelling saltfish. further afield than Norfolk for holidays. It’s a world away from the sterility of the supermarkets. 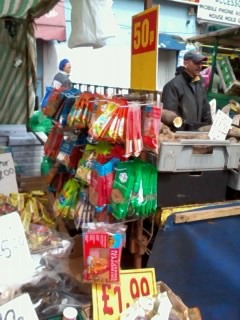 for a pound a bowl. 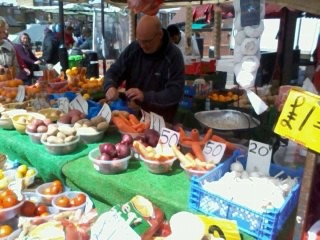 selling anything at 50p a bowl, and loaded up with 6 onions and 7 carrots. so much more feasible than raising £1.10. Sainsbury’s Basics Kidney Beans down from 21p to 14p. luxury of that choice, unlike so many, many others.